As you know, prepositions are essential to be able to improve your English. Do you remember what they are? Watch the video and listen to the song carefully. Wouldn't it be a good idea to listen to it again with the help of the lyrics? "In the west it sanks." Paco has just arrived at the International Airport in Mumbai. The airport is so big that he has spent half an hour searching for the correct desk to get the ticket to Shanghai. In these sentences from the passage of the Reading activity in the previous section, the words in bold are verbs which are frequently followed by one or more concrete prepositions. Can you find some other verbs of this kind in the passage. Try to find at least five of them. The woman apologises to him for not having seen him and continues running. He wants to escape from that place as soon as he can. Once at the desk he politely asks a clerk for a ticket for the next flight to Shanghai. He will buy the ticket now and leave for Shanghai on Friday. “... I could never complain to you about that”. 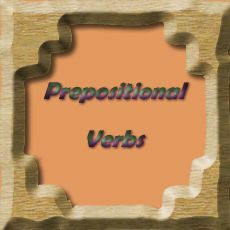 There are dictionaries and plenty of lists similar to the one you have downloaded in which you can easily find those verbs which are frequently followed by prepositions. Of course, those lists can also be found on the web. Click here to consult an extraordinary online dictionary of that kind. 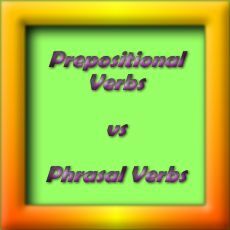 As for the practise after having studied those verbs, click here. And by clicking here, you will be able to practice not only the verbs included in the list provided but also some others. Finally, for those of you who feel like going further into the topic, click on the picture to get a file where prepositional and phrasal verbs are discussed. Although you don't have to learn everything said in the file, remember, first, that whenever you come into contact with English, you improve your English, and, secondly, that the more you read, listen to, speak and write, the better for your improvement of the language. Unfortunately, those verbs which are normally followed by a preposition (prepositional verbs) must be learnt by heart. Click on the picture to download a file with the ones you should learn. Choose the best prepositions to complete the sentences. 1. The clerk insisted ____ the subject. 2. Paco agreed ___ the clerk's proposal. 3. It depends ___ who helps Paco. He will succeed ___ getting the ticket. 4. I'm looking forward ___ hearing ___ you soon. 5. The clerk apologized ___ Paco ___ not having any alternative flight. This is the end of topic 5. However, in next section you will be able to improve your English by doing more exercises related to all the subjects studied in the topic. Come on, let's do them. They are easy!